One of the great things about Northern Ireland is how quickly some of the most beautiful destinations can be reached (no wonder the HBO guys are here shooting for Game of Thrones). Less than an hour since our adventure-fueling-big breakfast, we arrived into sunny Newcastle, County Down. And good news - no unexpected rain or thick fog covering the top of the mountains. Standing at 852m above sea level, Slieve Donard is Northern Ireland's highest point. ...or from Bloody Bridge, which is our preferred option and where we set off from today. It's only an extra 10 minutes drive out the southern side of Newcastle, on the Kilkeel Road. Blink and you'll miss it though. The car park has space for about 30 vehicles, with decent toilet/changing facilities (free of charge). The start of the Donard climb begins just the other side of the road. Needless to say, take caution when crossing. As the sign below says, please DO remember to close the gate behind you. In no time you'll see sheep, goats/rams (and this one time a few horses) wandering freely around the open mountainside. Dogs should be kept on leads. In some of the photos below, Max appears off the lead - this was only to grab a decent pic in parts where we could see clearly around us. Sheep have appeared out of nowhere in the past - a danger to both your pooch and farm animals themselves. Less than five minutes into the walk, the landscape is spectacular. As you walk alongside Bloody Bridge River you'll come across large areas of exposed rock, rushing mini waterfalls and rock pools. If the weather's great, expect to see local kids bombing into some of the deeper ones. Or if the weather's been poor, expect to see the same kids in wetsuits as the water gets deeper and faster. Crazy. Notice the darkness of the photos already? Yep, despite it being a crisp, clear day, the sun was already casting long shadows around us. Eventually you'll see a sign directing you to the other side of the river - luckily the days before hadn't seen any rain, so the water levels were low for an easy crossing. Wonder how easy this would be after a week of rain? Over on the other side was a quick reminder of why the extending lead was important. A sudden concentration-faced-Max spotted some sheep hanging out down the bank. Around halfway up the mountainside, the landscape quickly turns into a boulder metropolis as you get closer to a disused quarry area. This makes for a great place to stop for lunch and explore. The waterfall in the main quarry 'cliff' was at a trickle this day - zoom in on the pic below. On other days after some rain the place is even more incredible - as well as giving a more substantial waterfall, the rainwater floods a lot of the immediate area around and makes for some 'interesting' puddle jumping. If you don't fancy getting wet though, there are alternative routes around it to the right. Beyond the quarry the path becomes a bit sporadic. If you didn't appreciate your sturdy footwear earlier, you will now. After around an hour and a half's walking, we reached the famous wall of the Mournes. Stretching on for 35km over 15 mountains, the wall took around 18 years to build and keeps grazing animals out of the water catchment area for Silent Valley Reservoir (which supplies Belfast it's water). For us, it marked another water break before making the final ascent to the top of Slieve Donard. Until this point, the journey from the car park was a steady moderate walk - but from this point onwards it's important to note the necessity for sturdy footwear and the need for a basic level of fitness. It may not look like much in the pic below, but you'll feel the burn quickly enough as you make your way up alongside the wall. Though the thighs do start feeling a tingle with the steepness, the quick increase in height does have its advantages. Check out the view already. ...and again, looking back down to where we came from. You can see that the wall disappears in the centre of the below photo. This is the deceiving 'dip' in the hill, where on the way up it convinces you you're just about to reach the top, but in reality you're just climbing the first giant 'step'. It was at this point we had to make a decision. The sun was just starting to disappear and we only had a small torch and our iPhone lights to rely on. The temperature was already starting to change too. Crap. 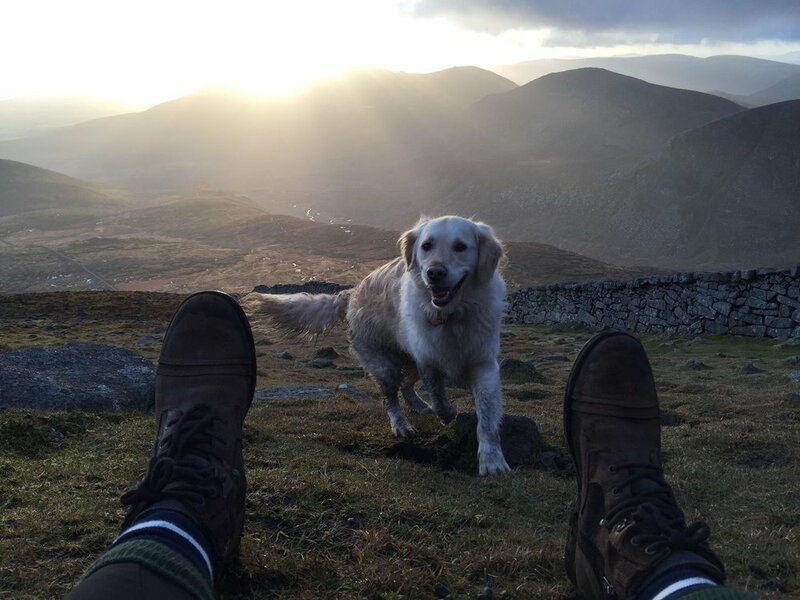 One reason being to take in the amazing sun setting over the Mournes, the other to think 'what's the worst that could happen?' I mean, if we dash down the hill to the quarry, from there the path is quite visible. Even if it's dark, the path is okay, no major boulders or sudden drops to worry about. Oh wait. There were some of those at the bottom. And the quarry has some very deep cuts into the land all around it. Max, you make the decision. And in no time, the feeling of failure is quickly replaced with that feeling of slight danger again. Thinking gravity would have us down in no time, the slippy hill, big rocks and plenty of muddy patches made for a slow journey back down. And looking back up behind us. ...and all too quickly, things got a bit tricky. This is where the photos stopped and all feeling of adventure went out the window. We could hear the river beside us and knew that following that for around another 30 minutes would bring us to another footbridge and eventually bloody bridge. In theory, easy. In reality, not so much. At one point we were stranded for a good 10 minutes on a ledge where our river was suddenly met by another on our left. That definitely wasn't there on the way up. Or was it? No idea. After slowly checking out the ledge (nearly on hands and knees), we found a gap in the bushes on the side of the verge and slid down it onto the bank below. Thankfully this is where we rejoined the path we had taken up the mountain and 20 minutes later we were arriving back into the car park, muddy, cold but relieved. So today's lesson? If you're climbing a mountain, get up there early. Despite the dodgy end to the day, looking back, those were some amazing views. So at around 5pm on this bright winter's day, we were technically standing taller than any other person in Northern Ireland.